If your class is held in MHS-Palmer, DO NOT FOLLOW directions from Mapquest, Google Maps, your car’s GPS, etc. 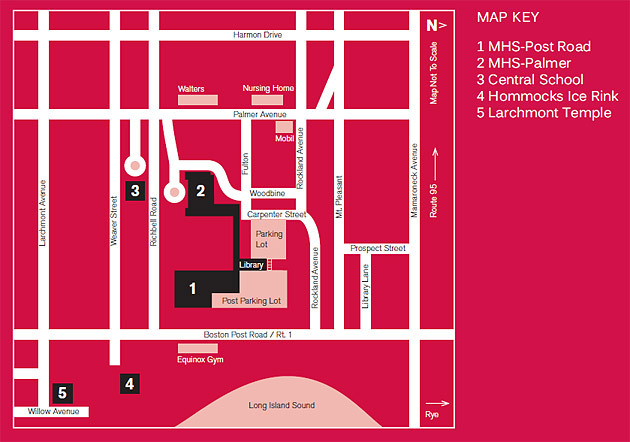 Directions from those sources will lead you to the Post Road Building of Mamaroneck High School. Follow only the directions listed below for the MHS-Palmer Building. Mamaroneck H.S., Post Road Building,1000 West Boston Post Road, Mamaroneck. Located between Richbell Road and Rockland Avenue on Boston Post Rd. (Rt. 1), across the street from the Equinox Gym. Park in the lot off the Boston Post Road. Enter through the main entrance (when facing the building, the doors to your extreme right) in the glass encased stairwell. Mamaroneck H.S., Palmer Building, Palmer Avenue, Mamaroneck. Located across the street from Walter’s Hot Dog Stand. From either Palmer Ave. or Boston Post Rd., turn onto Rockland Ave. Turn onto Carpenter Place. At the end of Carpenter, turn right at the stop sign. Make your first left into the driveway of the building and you may park in any staff parking space. The entrance to the building is around the front, across from the flag pole in the circular driveway. DO NOT FOLLOW DIRECTIONS FROM MAPQUEST, GOOGLE MAPS, YOUR CAR’S GPS, ETC. TO THE PALMER BUILDING, FOLLOW THESE INSTEAD. 1100 Palmer Avenue, Larchmont. Located off Palmer Avenue, one block north of Weaver Street. 75 Larchmont Avenue, Larchmont. Take Boston Post Road to Larchmont Avenue, turn south (toward Long Island Sound). Temple is 3 blocks down on the left at the corner of Willow Avenue. Enter through the side door on Willow Avenue. Park on Willow or Larchmont Avenues. 136 Prospect Avenue, Mamaroneck. Located between Mamaroneck Avenue and Mt. Pleasant Avenue, at the corner of Library Lane. It is north of Boston Post Road and south of Palmer Avenue. From Boston Post Rd, turn north onto Mt. Pleasant Avenue. At first stop sign turn right onto Prospect Avenue. Park in the metered spots along Prospect Avenue or in the parking garage across from Village Hall. 2089 Boston Post Road, Larchmont. Located between Chatsworth Avenue and Larchmont Avenue. Harbor Island Park is located at the end of Mamaroneck Avenue and Boston Post Road in Mamaroneck. From Boston Post Road, turn south (towards Long Island Sound) and follow the road into the parking lot. From Boston Post Road in Larchmont turn onto Bronson Avenue. At end of the street, turn left onto Locust Avenue and follow into Flint Park.